Selfie is the one of the most popular kinds of photo for people to post on the social network. However, general selfie cannot cater for the appetite of people because what the audience like is the special or innovative selfie. The appearance of Fosjoas V2 electric unicycle encourages the enthusiasm of people since Fosjoas V2 can be the best match for selfie when you're traveling around. The electric scooter is also the best tool for those photographers to take photo on the street. Step on Fosjoas V2 with some poses, then take a selfie to the social network. The photo must attract the attention of friends immediately since Fosjoas is with unique design. Traveling with the two-wheeled electric scooter will make the selfie on the way more colorful and cool. The slefie must be appreciated by friends. If selfie is not welcomed by some riders, Fosjoas V2 can take them to record others on the street through the camera. The upgraded pedals of Fosjoas V2 with wider surface can help the riders to stand steadily. 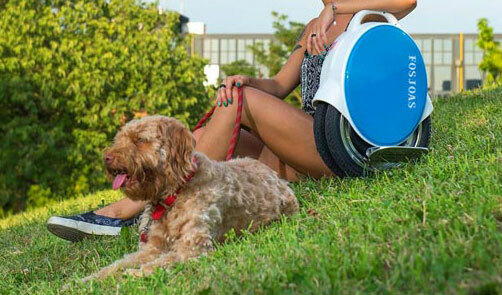 The electric scooter can allow the photographers to pass the narrow path, the hills or the big parks. What photographers need to do is to note the interesting scenes and record them, which is also popular among the young. Fosjoas V2 is equipped with imported Sony lithium battery to guarantee the power of the electric self-balancing scooter, so users do not need to worry about the lack of electricity even they ride the scooter for a long time. Just ride Fosjoas V2 to shuttle between street to street to take photo of the scenes and pedestrians, which can save the energy as well as time. Take selfie or photos to record each moment of the life with the accompany of Fosjoas V2. Those memories must be more remarkable since the electric scooter can change the lifestyle and the way of traveling.